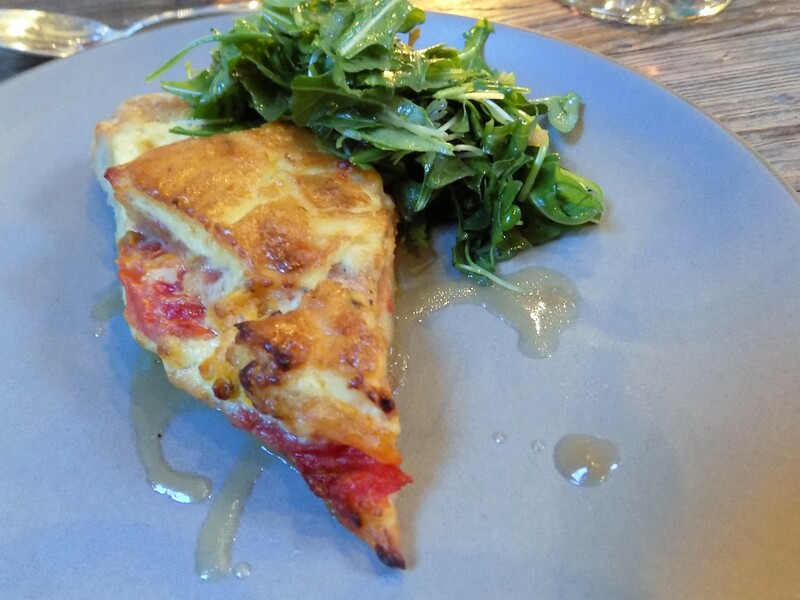 I’ve stopped trying to rank the meals I’ve had at the Friends of the Café dinners at the Alabama Chanin factory in Florence. When I think a Factory meal can’t be topped, I travel over to the Shoals and have another meal that once again makes me appreciate food in a new way. 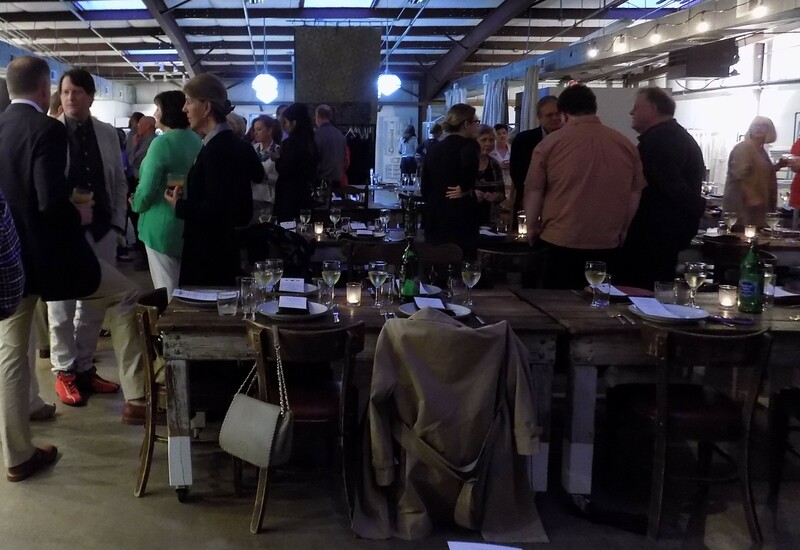 I have missed a few of the Factory events but I think I have now attended six or seven starting with an amazing dinner featuring the food creations of chef Vivian Howard in July 2014. 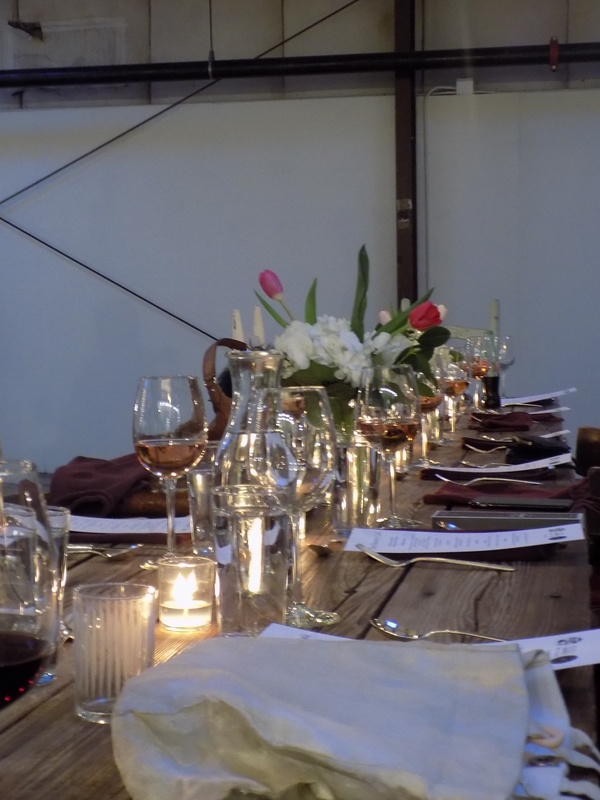 The Factory’s own executive chef, Zachariah Chanin, and his staff created a truly memorable Spring Harvest dinner in May 2016 that blew me away with its exquisite simplicity and low-key elegance. 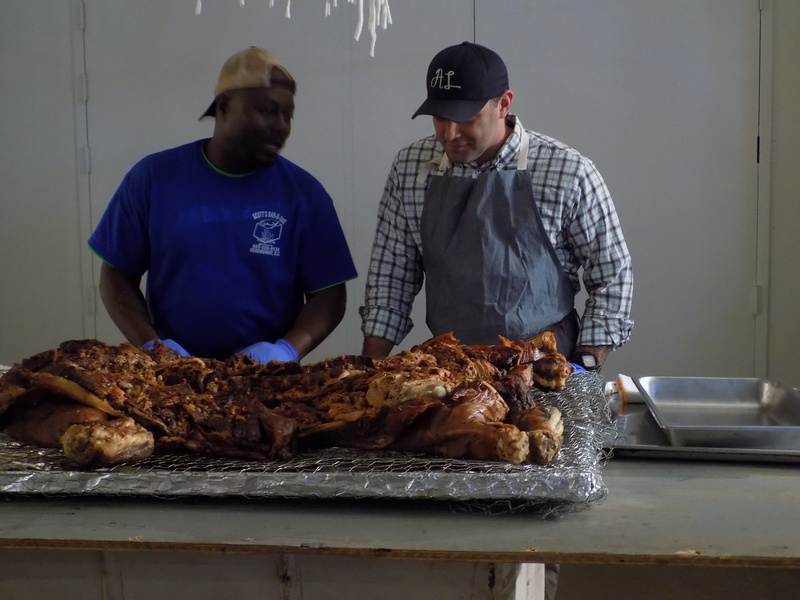 That meal was not long after the legendary Frank Stitt and South Carolina pitmaster Rodney Scott teamed up for an amazing spread featuring Scott’s savory whole hog and a slough of accompanying sides by Stitt and his crew. 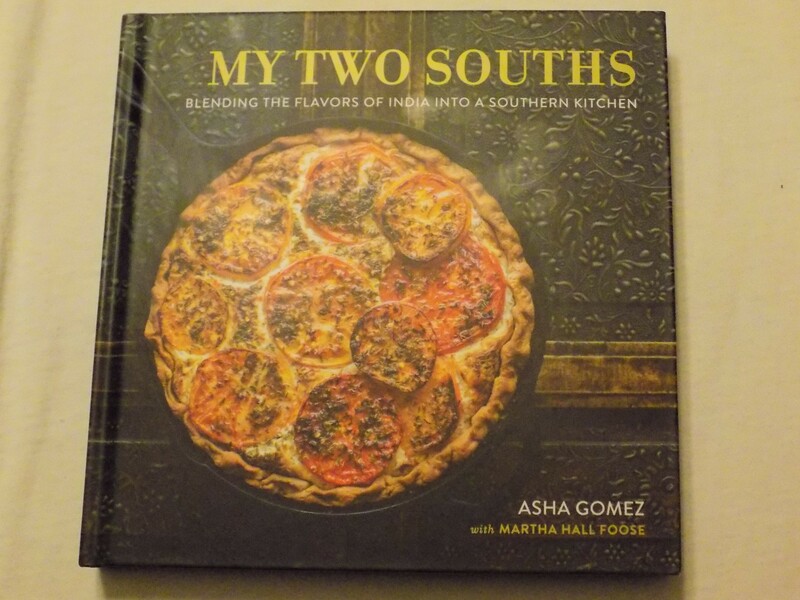 So it was with great excitement and anticipation that my friend Anne and I trekked back to the Shoals for a late-summer dinner featuring chef Adam Evans, a Shoals native, and benefiting Southern Foodways Alliance. Evans is transitioning now after several years in Atlanta with gigs at The Optimist and Brezza Cucina; exciting rumors were circulating at the dinner about where he may launch his next culinary venture and, if they are true, I may have many more opportunities to sample his exciting food. 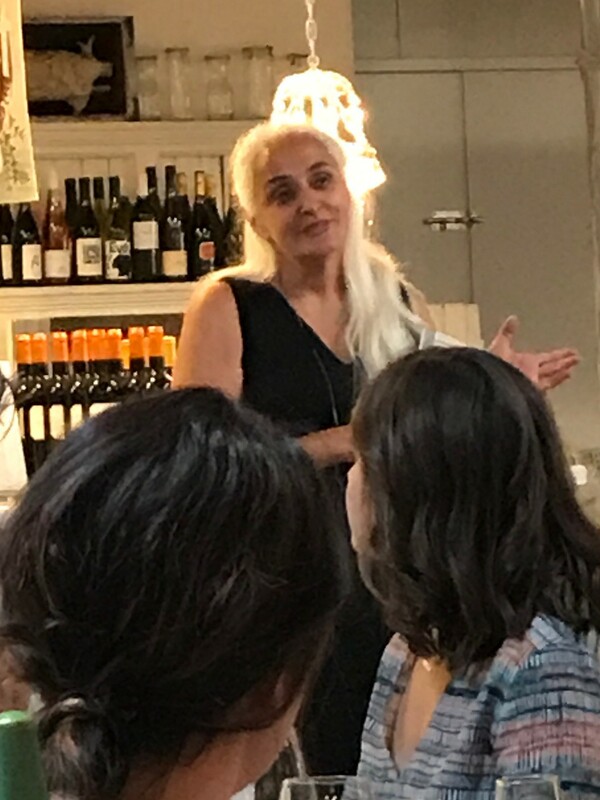 I have written in more than one essay about how Natalie Chanin promotes community in her work and design and in her outreaches such as the Factory dinners. At Zach’s dinner in May we sat across from a charming couple from Indianapolis and at the Evans dinner our dining partners were another great couple from Tulsa. 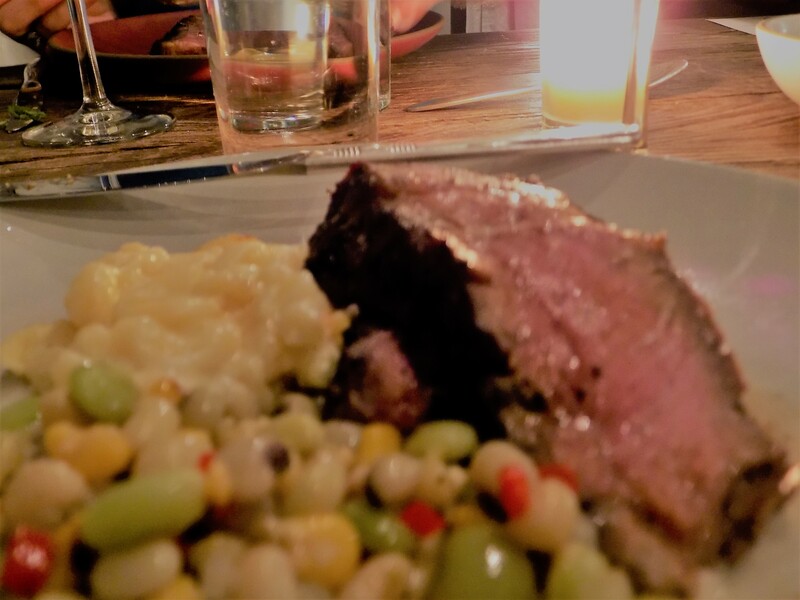 Chef Adam’s meal was personal and full of surprises, telling his story of working in restaurants in many locales with the feast “beginning and ending right here in Alabama” as the menu note stated. Passed around hors d’oeuvres included grilled oysters and lemon butter, pork belly and watermelon, lobster roll bites, and tomato and bacon tea cake sandwiches. 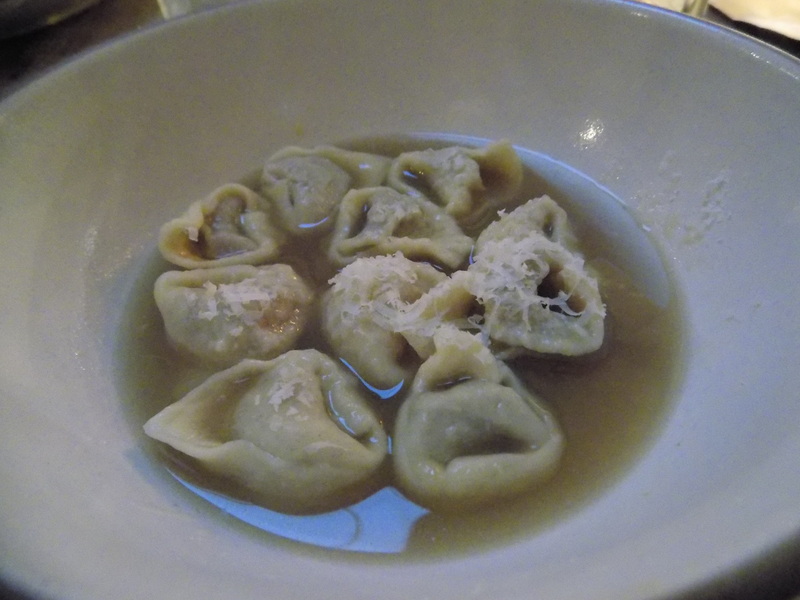 The big surprise of the hors d’oeuvres was a chicken stew soup dumpling which demanded to be downed in one satisfying bite. The savory dumpling had a filling of actual chicken soup that was a surprise and a unique treat. There were wine pairings with every course. 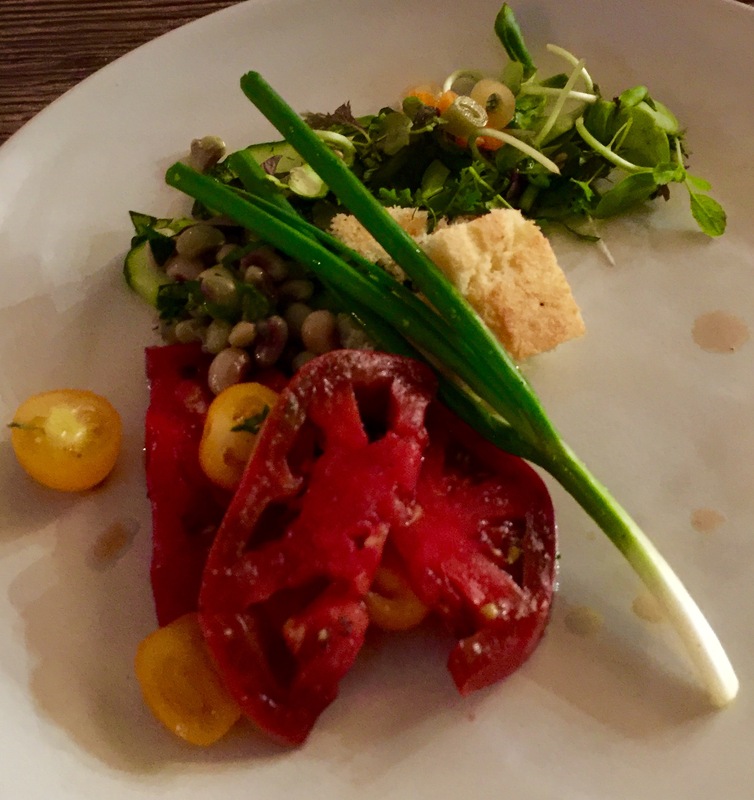 When the diners were seated, we were served a beautiful garden salad harvested from the garden of “Henry H.” – the chef’s late grandfather. Henry’s garden is still maintained by chef Adam’s father. 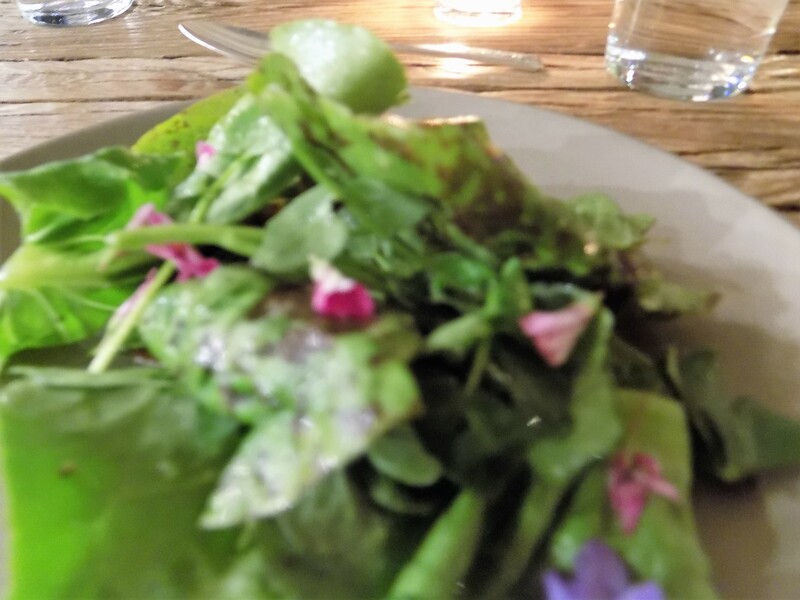 The chef’s story of the garden was as moving as the salad was good. The surprises continued with a second course of a seafood gumbo with a lot of heat. In lieu of the serving of rice that usually accompanies gumbo, this gumbo had a dollop of potato salad on top. 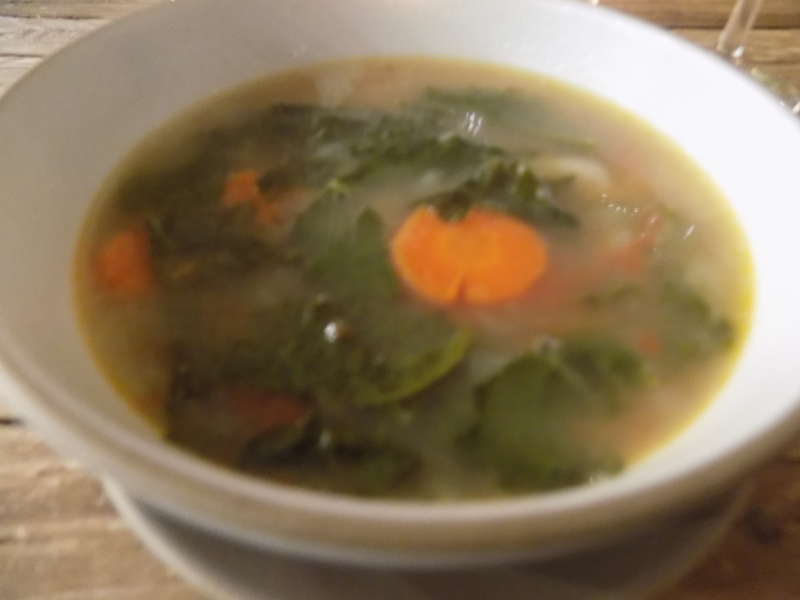 It might not sound good but everybody was raving about the gumbo – potato salad combination. John T. Edge of the Southern Foodways Alliance was among the diners and asked for the chef to come out and explain the potato salad with the gumbo. It turns out Evans picked it up from the father of a friend when he was working in New Orleans. He said the man made a great gumbo and always put potato salad on top. It’s a touch I plan to remember and steal. 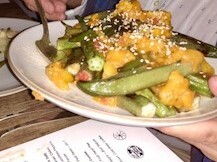 Indeed, I think Chef Evans managed to introduce a southern food way that surprised even John T. Edge. 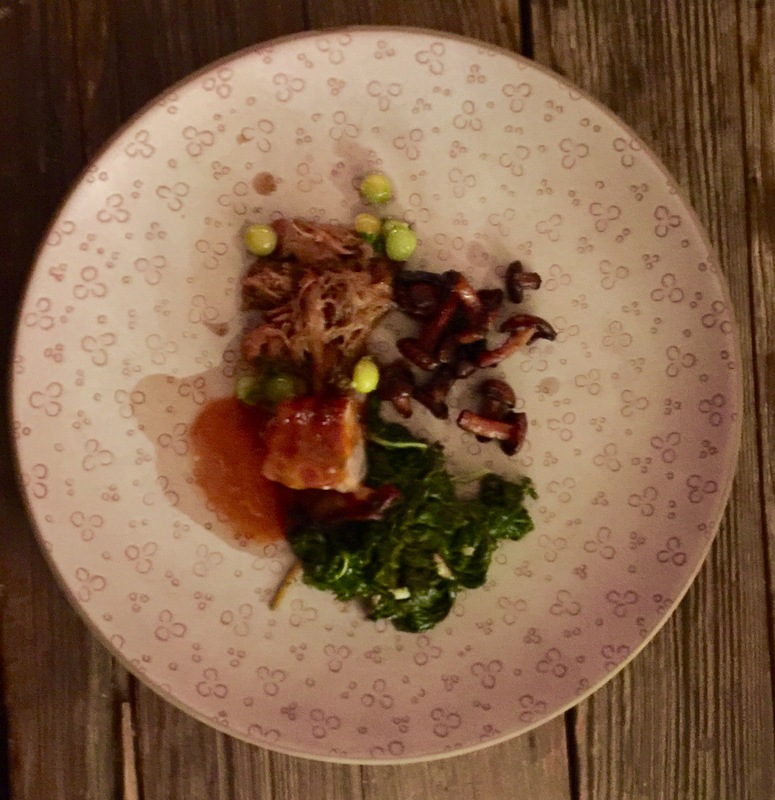 The third course featured pancetta wrapped guinea hen with chanterelle mushroom, husked cherry, and Swiss chard. 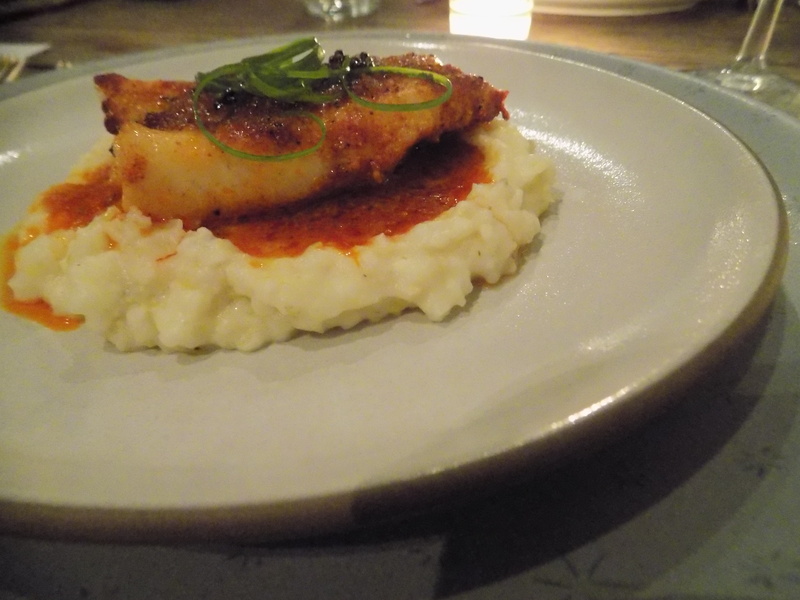 Just when it seemed the chef couldn’t possibly top himself, the fourth course arrived with duckfat poached Gulf swordfish with Carolina Gold rice grits, corn, charred okra, and shrimp chili butter. 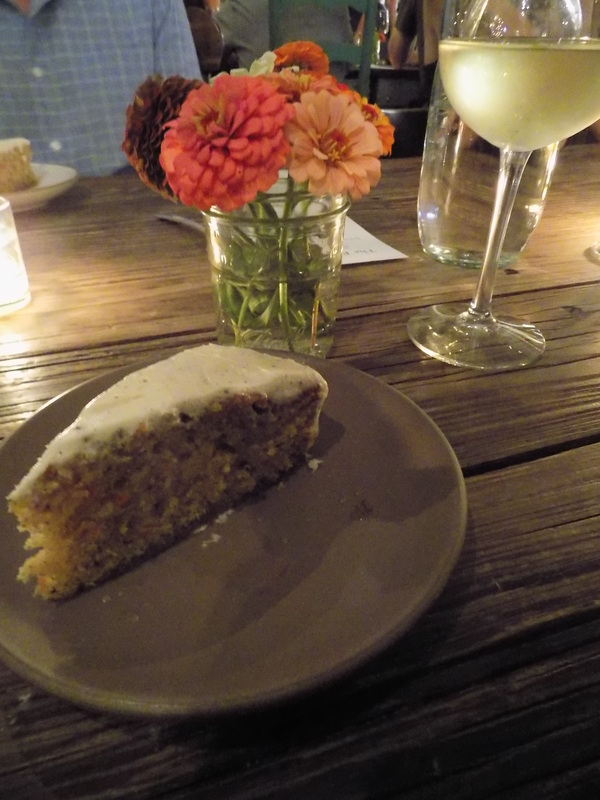 Finally, a muscadine and fig crisp was served for dessert, the staff was introduced, and fond partings were exchanged with the community that had assembled for the evening in the very special place that Alabama Chanin has built in Florence in the Alabama Shoals. If I had known that “lifestyle guru” would be a thing that people might make a living at, and if I had managed to become one, I’m sure I would be proselytizing for the Alabama Chanin aesthetic and, after the meal of a couple of weeks ago, for the homegrown and brilliant culinary aesthetic of Adam Evans. 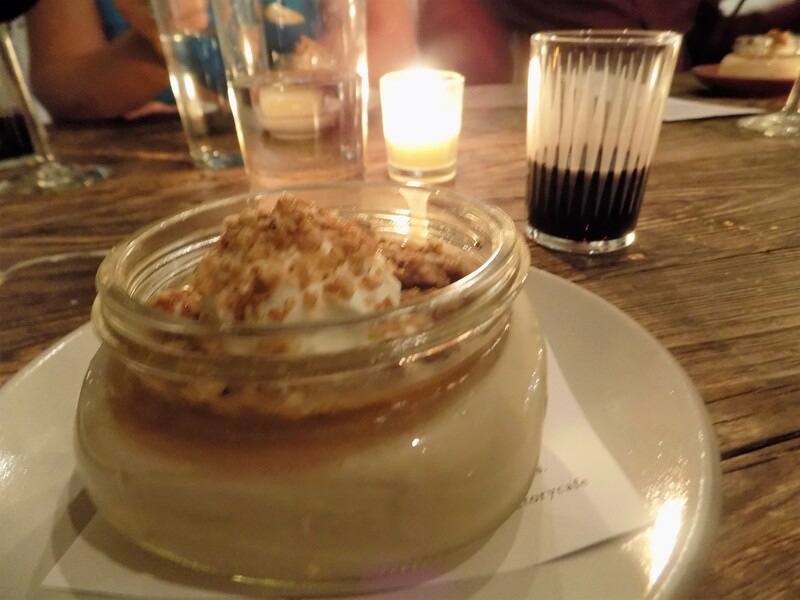 As always, I can’t wait for the next Friends of the Café dinner in October. This entry was posted in Chef Adam Evans, Friends of the Cafe Dinner and tagged Alabama Chanin, Chef Adam Evans, Chef Frank Stitt, Chef Vivian Howard, Chef Zachariah Chanin, Florence Alabama, Friends of the Cafe, John T. Edge, Natalie Chanin, Pitmaster Rodney Scott, Southern Foodways Alliance, the Shoals on September 8, 2016 by gedwardjourney. So here’s the deal: Because of family matters in Birmingham, I have not spent an entire weekend in my house in eleven months. On the weekend of May 20 through 22 I had a dinner engagement over in the Shoals in Florence and planned to spend the weekend at my house and return to Birmingham on Monday (I am on a break until Memorial Day). On Friday morning I began to cultivate a kitchen herb garden in my tiny back yard and re-pot and re-plant some things that have been neglected in the past year. I met with my friends Scott and Michelle and their two daughters for dinner at a favorite chili place on Friday night but the daughters preferred Mexican with buddies so Scott and I were dumped and had to be bachelors for the night (well, Scott did – I’m always a bachelor for the night). My friend Cindy, who was supposed to be my companion on Saturday night in Florence, was forced to cancel and I was suddenly looking at wasting a much sought-after ticket for a sold out dinner. These are amazing dinners, however, so I was going whether the other ticket was taken or not. I immediately thought of my friend Anne who lives in Decatur – about halfway between Huntsville and Florence. 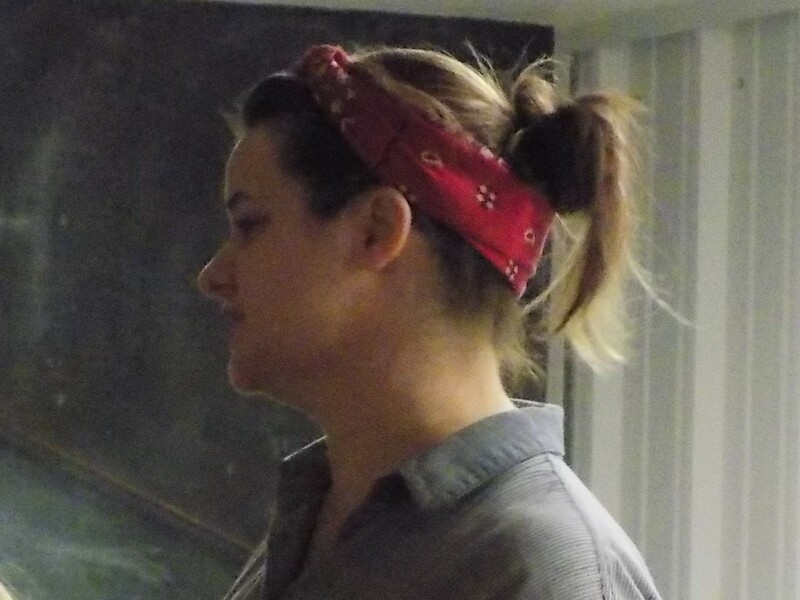 I also remembered that my friend Anne is a very busy and active woman and would most likely be out-of-town for the weekend. Just before I got to Anne’s house in Decatur, my “low tire pressure” warning came on and I pulled into the driveway with a tire rapidly deflating. Anne was happy to drive her car and I decided to deal with the tire after the dinner. As we prepared to leave for the Shoals, Anne’s beloved 16-year-old Jack Russell terrier, Zeke, had a frightening seizure and Anne rallied to try to get Zeke through the crisis. Zeke’s seizure ended but he remained disoriented and Anne called upon a trusted friend to sit with him for the evening. Slightly disoriented ourselves, Anne and I left Decatur in Anne’s vehicle and she said the only stop we needed to make was for “petrol.” We pulled into a station on the outskirts of town and suddenly were met with a Michael Jackson impersonator with full Michael Thriller-era wig and complexion performing full out to “Beat It” in the filling station parking lot. Anne assured me that he was a Decatur tradition and passing vehicles rolled down their windows and cheered him as they passed. Anne wanted to tip him but I wasn’t so sure. Now I wish we had because how many guys are committed enough to run around performing Thriller tracks in Decatur in full Michael drag? Next time I see him, I’ll take a picture. He gets a tip from me next time. 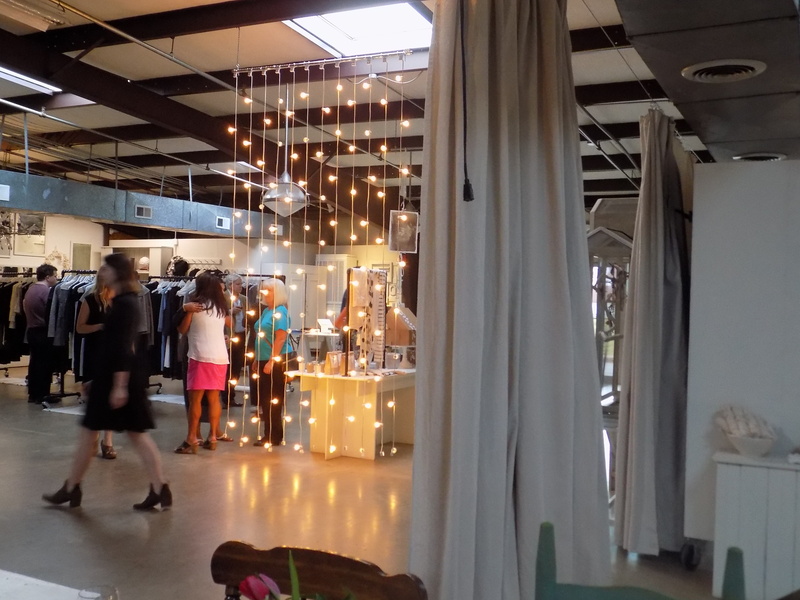 When we got to the Alabama Chanin Factory in Florence for the Spring Harvest Friends of the Café dinner, the place was already jovial and full and hors d’oeuvres were being passed. We grabbed a devilled egg and headed toward the dining area and were greeted by Natalie Chanin, the acclaimed “slow fashion” designer and host for the dinner (www.alabamachanin.com). Anne was her always charming self, as was Natalie, but as we moved away Anne muttered “I’ve wanted to meet Natalie Chanin for years and when I finally do I have egg in my mouth.” Not to worry – Anne had another conversation with the designer at the end of the evening and I don’t think there was any notice of the hors d’oeuvres incident. 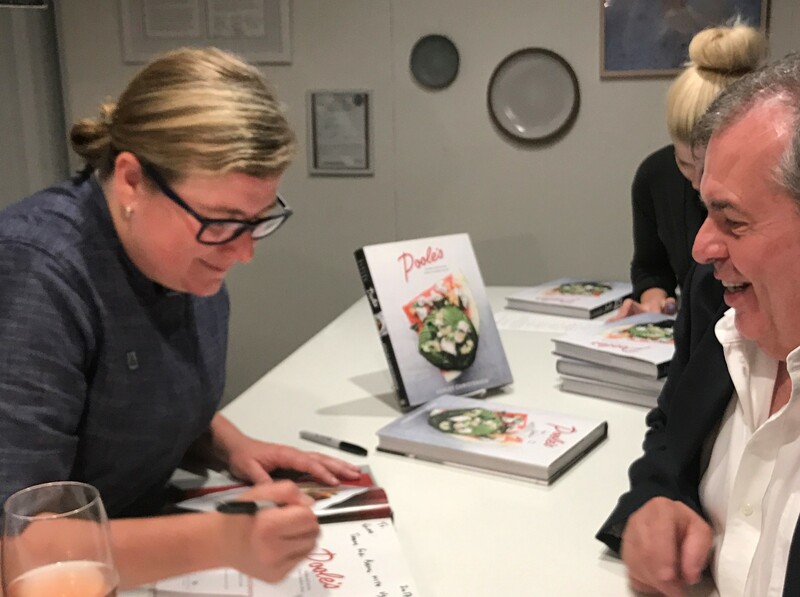 I need to write an essay on the dinner itself, and I plan to (but I got no decent photos – was far too busy eating the food and chatting). 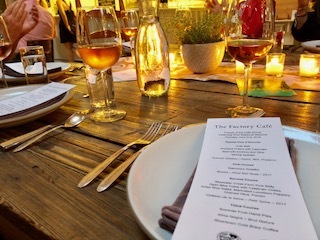 The featured chef for the evening was the Factory’s resident chef, Zachariah Chanin, and it was one of my favorite meals ever at the space (I think I’ve made six of the ten Friends of the Café evenings). The amazingly fresh spring harvest ingredients were primarily from Bluewater Creek Farm in Killen, Alabama, an organic farm run by Collins and Liz Davis in partnership with Doug and Donna Woodford (www.bluewatercreekfarm.com). 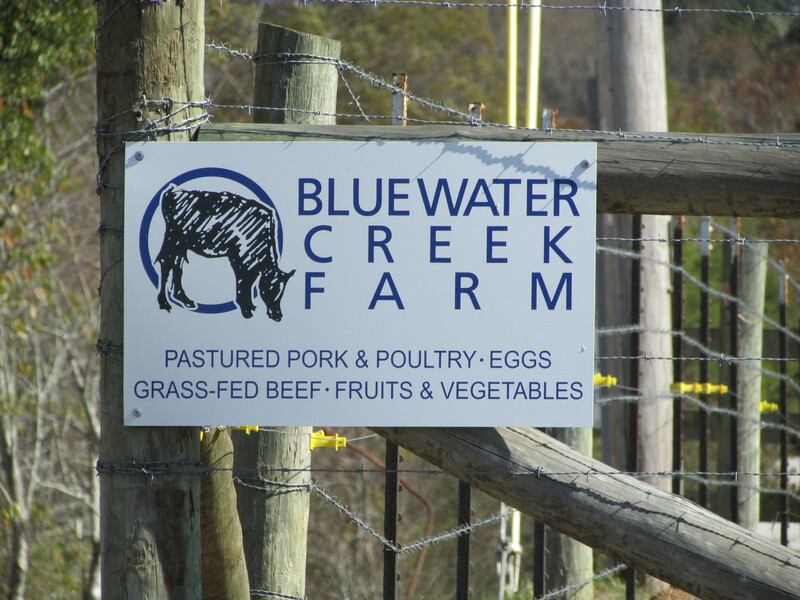 I wrote about my tour of Bluewater Creek Farm in the essay “Sustainability and Soul” in November 2014. Suffice it to say, the meal was brilliant. 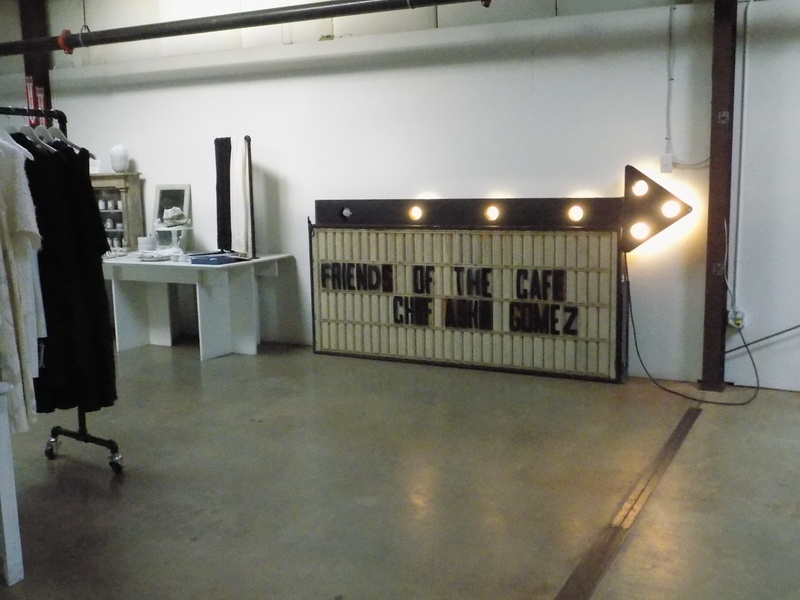 Each Friends of the Café event is a benefit and this one was no different. 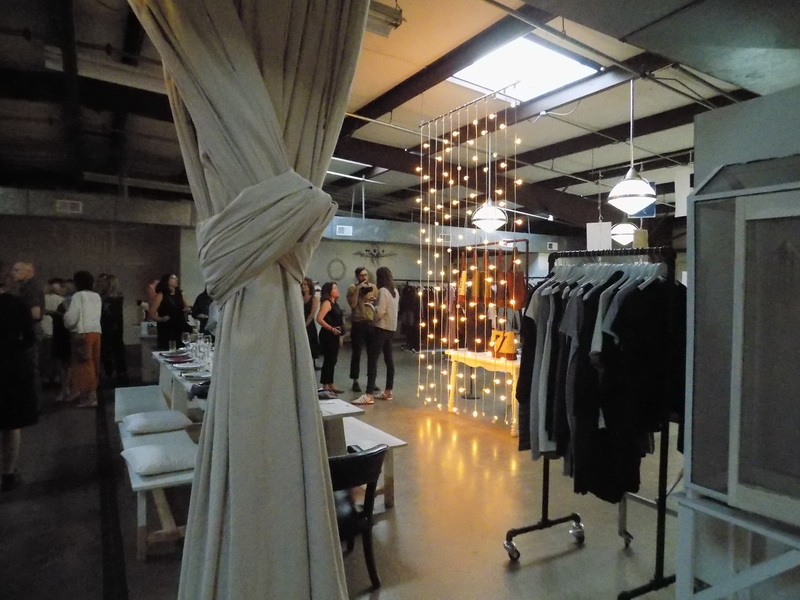 The honoree was Nest, a non-profit organization that supports artisans and makers throughout the world and with which Alabama Chanin is very involved (www.buildanest.org). 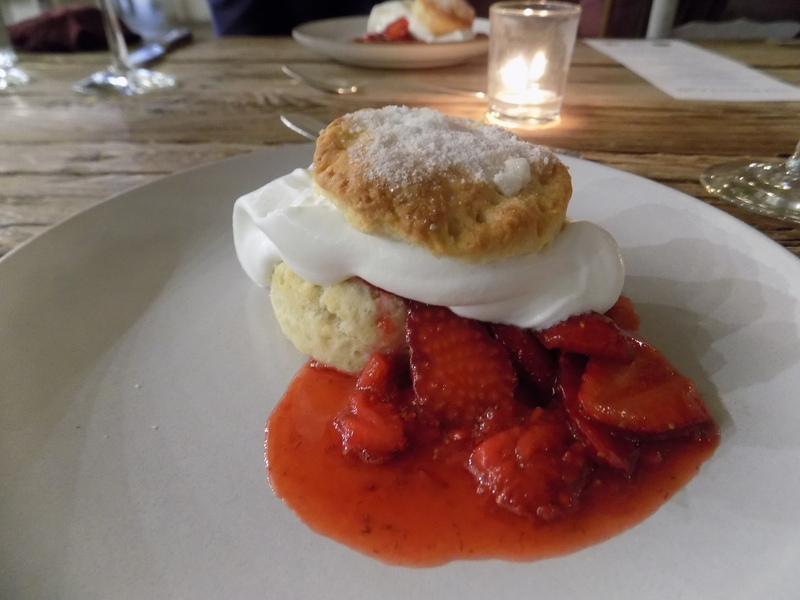 Incidentally, the dessert, a strawberry shortcake with local strawberries macerated in a thyme simple syrup with freshly whipped cream is assuredly the best and freshest I’ve ever tasted. Almost as good as the dessert’s taste was watching Zach Chanin and his staff assembling the dozens of desserts on the café bar. 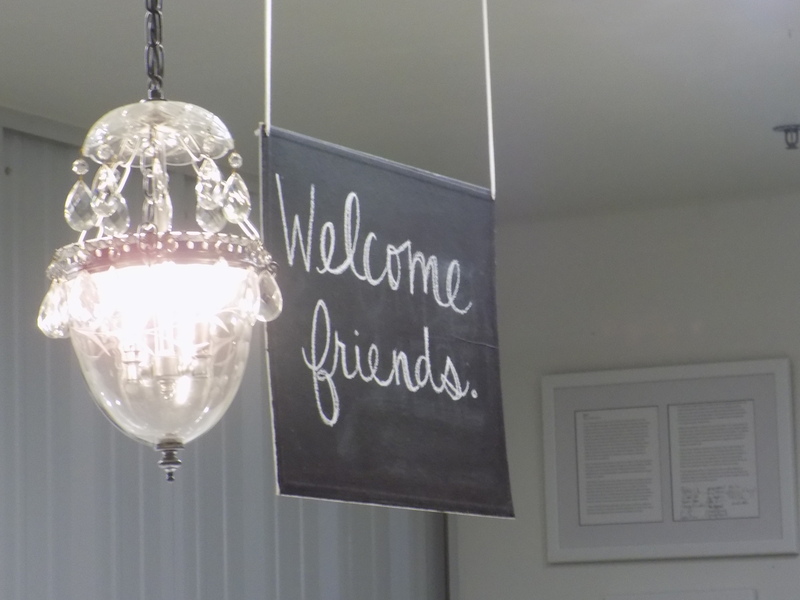 As always, new acquaintances and friends were made at the family-style seating. Anne and I sat across from a couple from Indianapolis. “What brings you to the Shoals?” I asked. “We drove down for dinner” was the honest reply. A family next to me had driven in from Corinth, Mississippi, for their first Factory meal and assured me they’d return. During dinner, a spontaneous conversation erupted at my end of the table about “Seinfeld” catch phrases. As always when I am at the Factory, the spirit of community and connection is palpable. In addition to the fine company in the room, Anne texted our friend Deb in Paris and we both wished she was with us. So the good feelings spread beyond Alabama and the Shoals and were truly international. After a thoroughly satisfying evening of food and sociability, we said our goodbyes and walked out under a bright and friendly full moon. When we got back to Decatur my tire was flat as a pancake. It was late. Anne offered her guest room and I decided AAA could wait until morning. By morning, I went downstairs to find Anne tending to a much calmer Zeke and my ruined tire was tended to by a particularly pleasant AAA tow truck driver. At last, I was back on the road and headed home. A very wise woman once advised me that I should reserve a part of each week to be quiet, relax, and regroup. When my schedule allows, that time has always been Sunday night at my house. I cook a good meal, sit quietly, and listen to soothing music until time to go to bed. As the voice got closer to my back gate I saw a woman looking in every direction and calling for Serenity. I told her I would keep an eye out for Serenity and asked what she looked like. Serenity is a Jack Russell terrier. As I write this, I am sitting in the tire store getting a new tire. The HVAC guy should be at the house by the time I get back, working on some outside conduits. I’ll pack to go back down to Birmingham where there seems to be a full schedule waiting for me, including a trip to Tuscaloosa, taking Mother and her neighbor to see the Cahaba lilies in bloom, this season’s first peach run to Chilton County, a Japanese steakhouse dinner to celebrate my nephew finishing sixth grade. This entry was posted in Alabama Chanin Factory, Friends of the Cafe and tagged Alabama, Alabama Chanin, Bluewater Creek Farm, Chef Zachariah Chanin, Florence Alabama, Friends of the Cafe, Natalie Chanin, Seinfeld, Serenity Now! on May 24, 2016 by gedwardjourney. The restorative powers of the Friends of the Café dinners at the Alabama Chanin Factory in Florence are palpable each time I go. At the most recent dinner I attended in March, walking through the factory doors had cathartic impact. 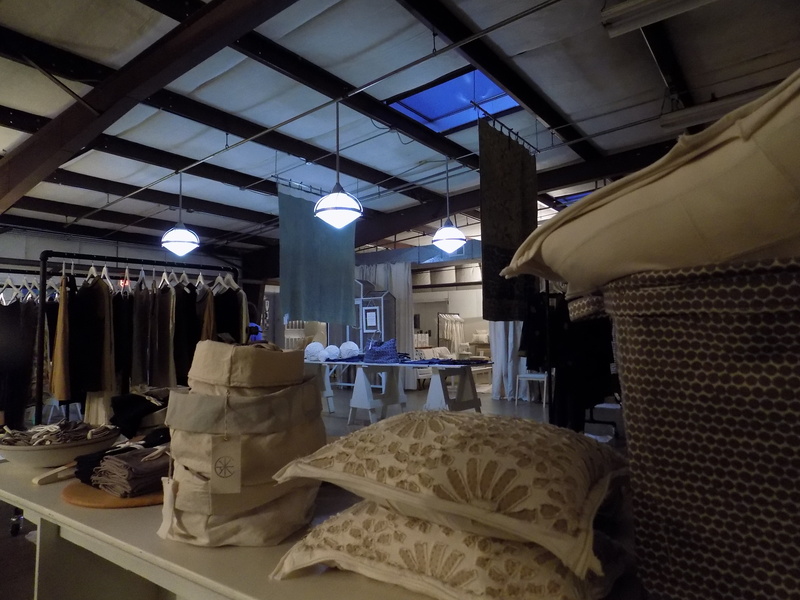 For those who have never visited the Alabama Chanin factory (www.alabamachanin.com) – which is the workplace for the artisans and craftspeople responsible for clothing designer Natalie Chanin’s line of organic hand-crafted clothing and other lifestyle products – the space itself has an instant sense of community and a tonic effect. The aesthetics of the place are in a harmonic balance and the products displayed in the retail area are diverse but somehow all work together. 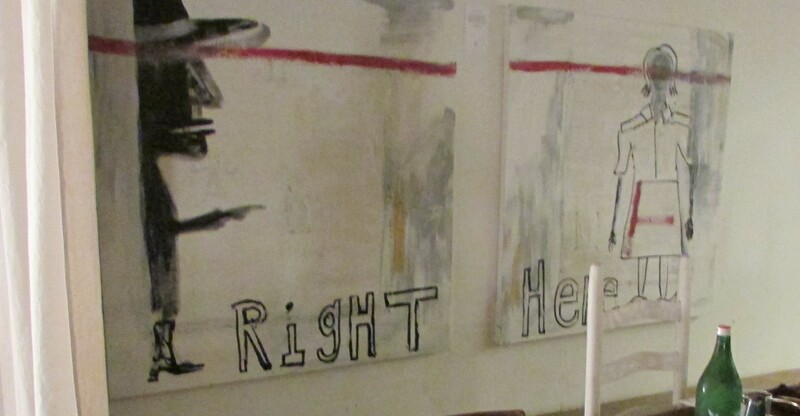 Art works and objects of interest are placed throughout; they are spare and do not overwhelm. The Factory’s Café is helmed by Zach Chanin, executive chef (and Natalie’s son), and serves exceptional and locally sourced menus daily. Periodically, however, the Factory hosts guest chefs and special evening meals that provide camaraderie and splendid dining. 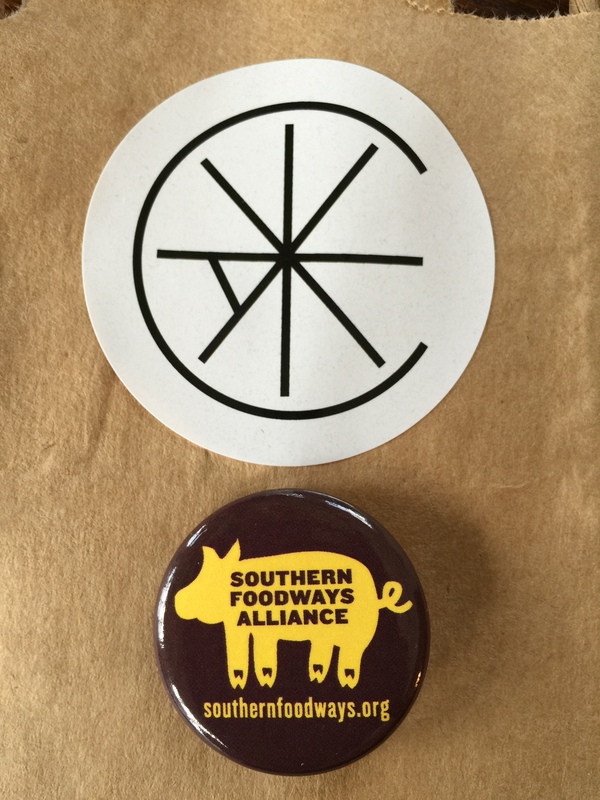 At the March event, the meal was the product of the unpredictable collaboration between Frank Stitt, Birmingham-based chef and restaurateur, and South Carolina pitmaster Rodney Scott. Stitt’s flagship Birmingham restaurant, Highlands Bar and Grill (www.highlandsbarandgrill.com), has been nominated for the James Beard Foundation’s “most outstanding restaurant” award for eight years in a row now. The 2016 winners will be announced in San Francisco at a ceremony on May 2. Scott’s Bar-B-Que (www.thescottsbbq.com) in Hemingway, South Carolina, is legendary among pork barbecue aficionados and gained new followers when the original cookhouse burned to the ground in 2013 and The Fatback Collective, a project of Southern Foodways Alliance (www.southernfoodways.org), teamed up to sponsor a “Rodney Scott’s Bar-B-Que in Exile Tour” to raise money to get Scott’s home turf back in operation. The “tour” travelled throughout the South, introducing his singular barbecue to an even broader audience. The combination of Stitt and Scott is an inspired pairing and the resulting meal at The Factory was masterful. Diners were greeted with a “Southern Apertivo Highball” featuring vermouth, Capelleti, citrus, bitters, and Birmingham’s Buffalo Rock Ginger Ale. 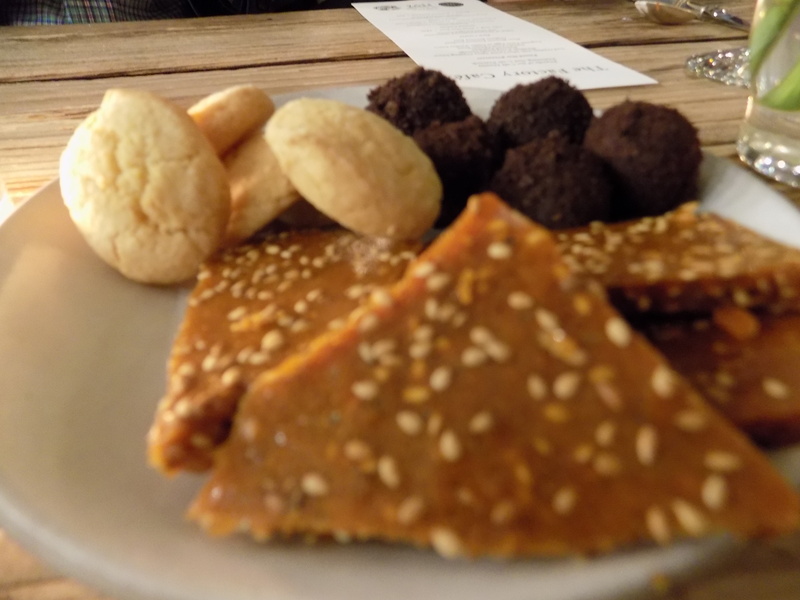 Pass-around hors d’oeuvres were crudités and a tasty combination of pork rind and pimento cheese. About twenty minutes before seating for the meal, as the diners assembled, Rodney Scott and Zach Chanin brought in the whole hog and displayed it on a table in the showroom. We all gathered like paparazzi to snap photos and take in the sight and the aromas. Frank Stitt introduced the meal by saying that Rodney Scott prepared the whole hog while Stitt and staff conceived and prepared the side dishes. Stitt was charmingly persnickety about the correct way to pass dishes at table. Grassroots Wines did the wine pairings with the various courses. After a beautiful asparagus salad with farm egg, “just dug” potatoes, and ham hock vinaigrette, the abundant second course was served family style. 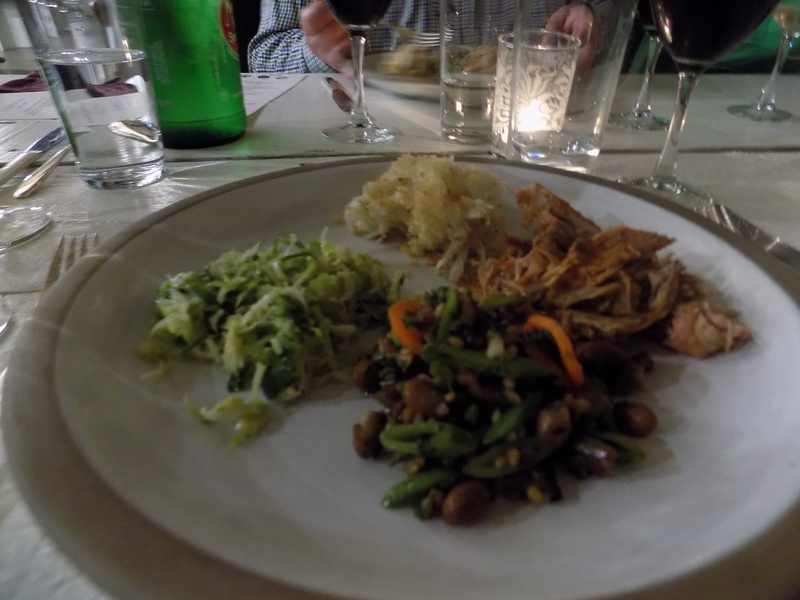 Mr. Scott’s magnificent barbecue pork was accompanied by a turnip gratin, a hearty salad featuring farro and barlotti beans with grilled red onion, and a Brussels sprout slaw with pecorino dressing. I recently told a vegetarian friend that even though pork was featured, she would have had no problem getting her fill from the side dishes. 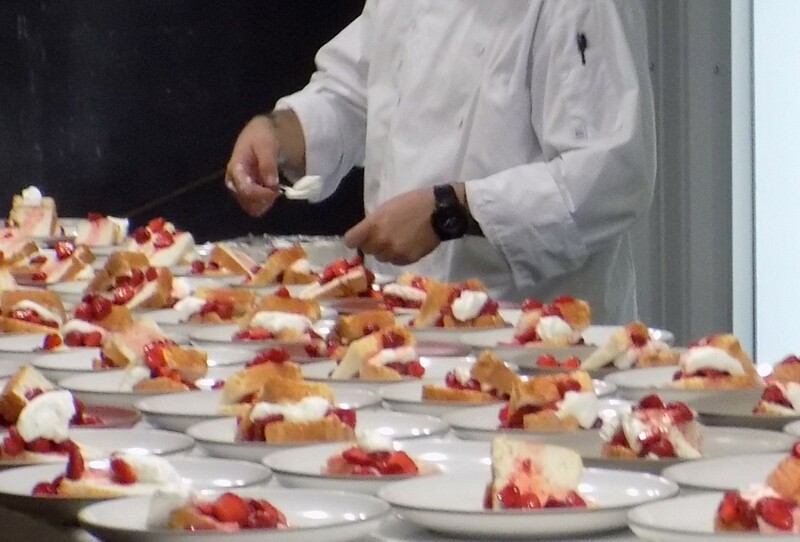 Dessert was Dol’s chocolate bourbon torte with marinated strawberries. “Dol” is Dolester Miles, the pastry chef at Highlands who is also nominated for a James Beard Award this year as outstanding pastry chef. If you have ever eaten one of Ms. Miles’s desserts, you will know that the nomination is highly deserved. I have written previous essays about the sense of pride and community that permeates events at The Factory. Amazing meals by renowned talents only add to the aura of the place that Natalie Chanin’s singular vision has created. Each time I leave a Factory event, I look forward to the next opportunity to be there. 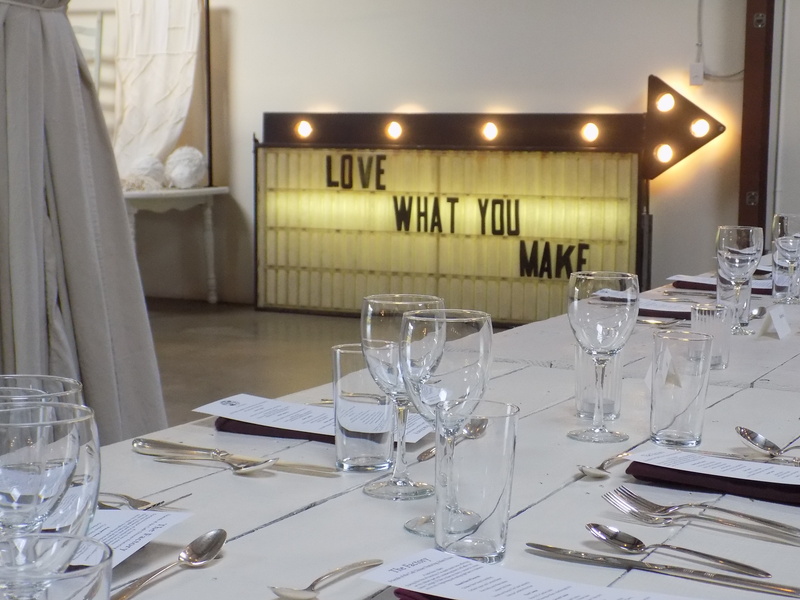 The next dinner at The Factory will feature in-house chef Zach Chanin. Can’t wait. This entry was posted in Alabama Chanin Factory and tagged Alabama Chanin, Buffalo Rock ginger ale, Frank Stitt, Friends of the Cafe dinners, Highlands Bar and Grill, James Beard Awards, Natalie Chanin, Pastry Chef Dolester Miles, Pitmaster Rodney Scott, Scott's Bar-B-Que, Southern Foodways Alliance, The Fatback Collective, Zach Chanin on May 2, 2016 by gedwardjourney.